On May 19, 2010 Roza Otunbaeva is appointed as the president of the Republic of Kyrgyzstan. To be specific, she selected herself for this position with, undoubtedly, total support of her "team". 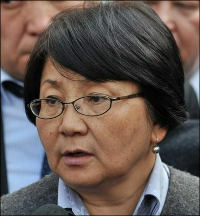 Being in total despair, following the sudden breakdown of previous regime, leaving the destroyed parts of demoralized state apparatus and escaped parliament, Roza Otunbaeva and her "team" hope that the decree on the appointment of president for transition period would partially solve the problem of government’s legitimization. It was expected to nominate Roza Otunbaeva as the presidential candidate at the referendum in June that must adopt new draft Constitution. Such decision was made at the joint session of interim government and constitutional council. Obviously, the events of May 19 accelerated the immediate emergence of interim president in Kyrgyzstan. Notably, there are decisions that need to be made by legitimate president and, most likely, such decisions will be made before the referendum, scheduled to June 27. Clearly, when the neighbors closed the borders, the crowds of policemen in casual dresses and looters flooded the streets, yesterday’s "grey figures" from Bakiev’s clan ride SUVs in the southern mountains, the government needs president, authorized by current constitution to solve urgent issues. I am affirmed that interim government and Roza Otunbaeva understand that such decision has authoritarian flavor. However, the appointed president with pre-agreed rights is not junta, especially if this president is Roza Otunbaeva. If moderating "democratic" outrage and not to hurry to condemn post-Bakiev government for such ignorance of official power transfer procedures, but to analyze current situation it is clear that life circumstances put the government and Kyrgyz statehood in the position that these actions, seemed to be radical from outside, perhaps, is the adequate response to the challenges of the political environment. Roza Otunbaeva is the ideal candidate for the position of interim president. Her appointed was already accepted by traditional "male rulers", competing with each other for the presidential chair, as certain compromise. Considering today’s balance of power in the interim government, there can be no usurpation of power by single person, similar to "Bakiev’s kingdom". These are different leader and team. There are different voters. The president will not become "lame duck" despite the fact that the end of her term was announced at the very first day of coming to throne (or scaffold). In this, at quick glance, not beneficial position it will be easier for Roza Otunbaeva to make unpopular decisions. From now on "the iron lady" of Kyrgyzstan does not have to play up "electoral caprices" of clans, groups and regions and she is granted the opportunity to make decisions, based on the logic of state building only. The only female politician among brave men, Roza Otunbaeva realizes the entire burden of responsibility. She is taking dirty and huge work. Roza is taking entire negative attitude of the society that will be inevitably hit the interim government. Perhaps, in Asian republic women is forgiven more than men. Men around Roza Otunbaeva let her take this burden. Hopefully, they understand what and for the sake of what she does that.